No, this is not a "Heavy Metal" pickup...but it is "made" of metal. Available in nickel or chrome plating, it is designed particularly for Epi Casinos, Gib 330's, 125's, 225's, 175's, 295's and other guitars of this ilk. 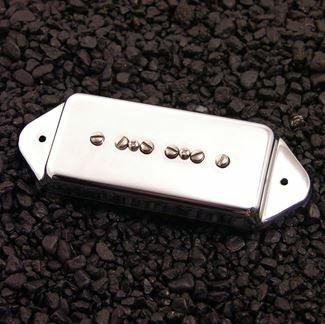 The tall bridge pickup cover has a moderately curved bottom for conforming to the mild arch of these instruments.